Sadly, I didn't take any images of Dylan's birthday party this past Saturday. We wheeled over the kegerator to his back yard and had on tap the Belgian Tripel (turned out really awesome), the Belgian Saison (turned out to be just right and excellent), the Belgian Golden Strong (despite being sweet, many enjoyed it), and a commercial keg of Ballast Point's Wahoo Wheat. The Saison tapped out into the night and the Tripel soon followed. I then put on tap the last of the Smoked Porter and ESB. Needless to say, they tapped out as well. The next day, all that remained was a small amount of the Golden Strong and about 1/3 of the Wahoo Wheat. Alas, I am dry (mostly). This is a typically a good opportunity to do some kegerator deep cleaning and maintenance. It seems that even with preventative measures, I need to do this rust repair about every 2 years. I believe I've had this kegerator since 2002 or 2003 and this is the 3rd time I've refinished the interior of the chest freezer. We moved the kegerator to my back yard and I started with some general cleaning using a slightly soapy towel. Above, you can see the pitting and rust that has built up over the past 2 years (when I last did this task). Amazingly, I recall the first bit of rust to start showing through in a matter of about 6 months after the repair. 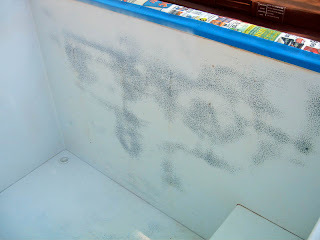 It always occurs in the same location of this Kenmore Chest Freezer. The front panel seems to be where most of the heat exchanging occurs. When the compressor is running, that panel is where the frost builds up and on the outside, it feels warm. 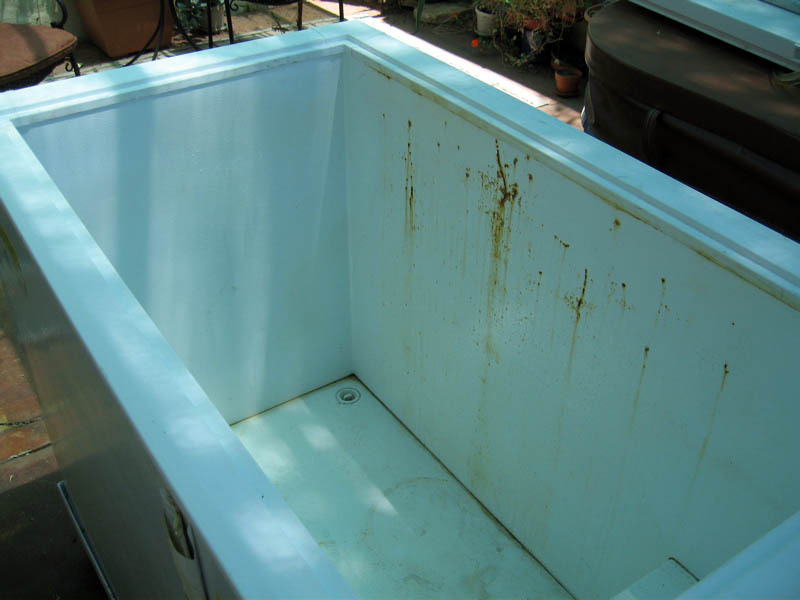 All this heating and cooling over time, coupled with moisture creates the perfect conditions for oxidation. After a good cleaning, I sanded all of the rust areas. This round, I had a palm sander and that made for a speedy sanding! I used 60 grit and that seemed to do the job very well. I finished with 220 to smooth out the surface before washing again to remove all of the debris. I forgot to take a snapshot of the sanding (too excited about all the time I was saving) so the image above is right after a few sweeps of the appliance paint. I sanded the rusty areas with the 60 grit and the 220 to smooth it out and all other areas in the interior. I spot sanded a few areas outside too that just had cosmetic knicks. 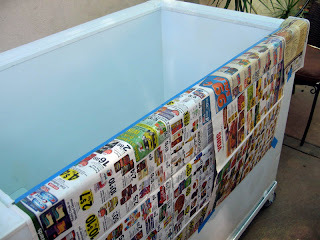 I tapped off the plastics on the upper lip of the chest freezer so I can spray (as much as possible) under the plastic without painting all over the plastic. The first time I did this repair, some paint on the plastic peeled off so I wanted to avoid that happening this time. Here's the paint. This is the same can I used during the refinishing in 2008. I finished the can this time. I can't recall the cost but they carry this in most paint and hardware stores. 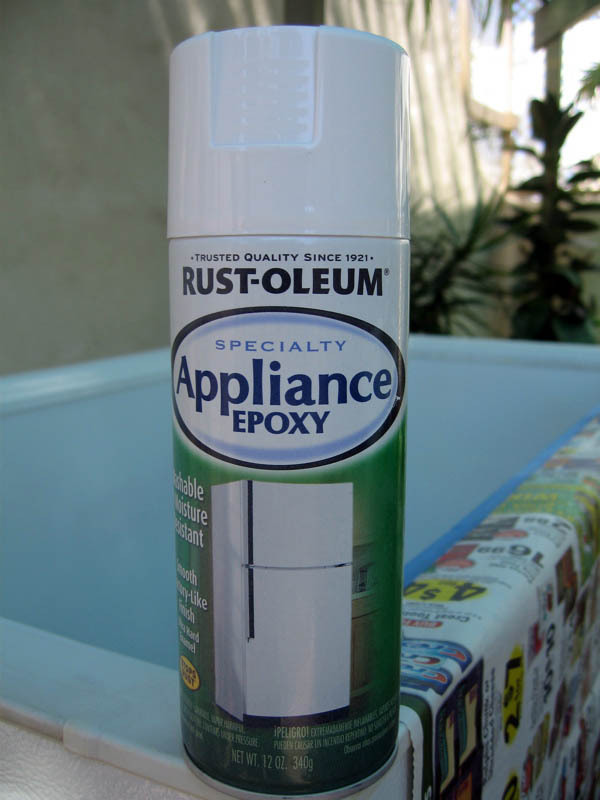 You need LOTS of ventilation when spraying this appliance epoxy. It seems to be very heavy and a huge cloud builds inside the chest freezer. Luckily, I had a nice breeze today that kept the cloud moving. 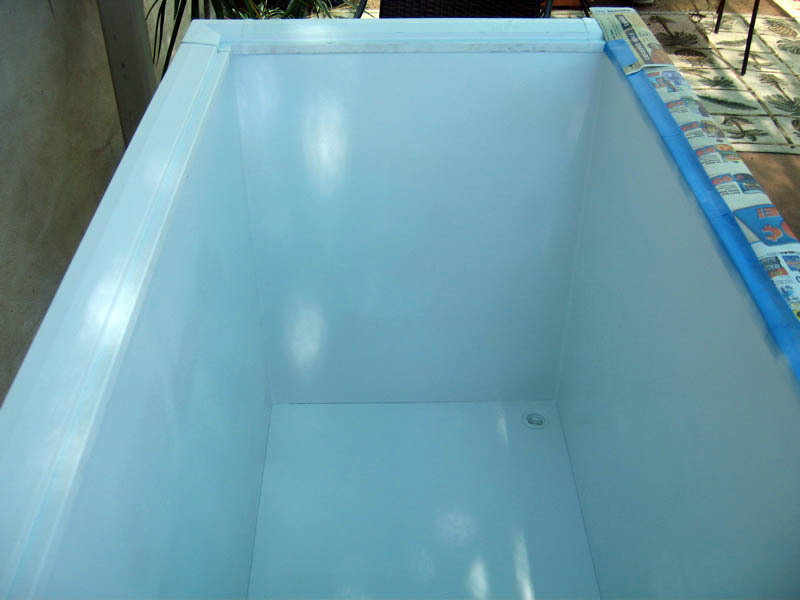 It dries to the touch in 2-4 hours, can be handled in 5-8 hours, and dries in 24 hours. The color matching is identical to all appliances that have that textured glossy white. After spraying the rusted areas, I lightly coated the other surfaces and a couple of areas on the outside. I had just enough paint to do the job. 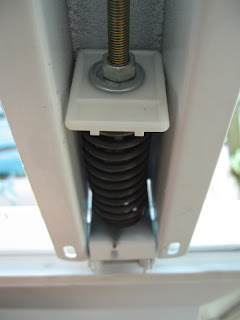 There's a bolt that allows you to adjust the preload of the spring. While there are only a handful of threads available, I spun that bolt down as far as I could. 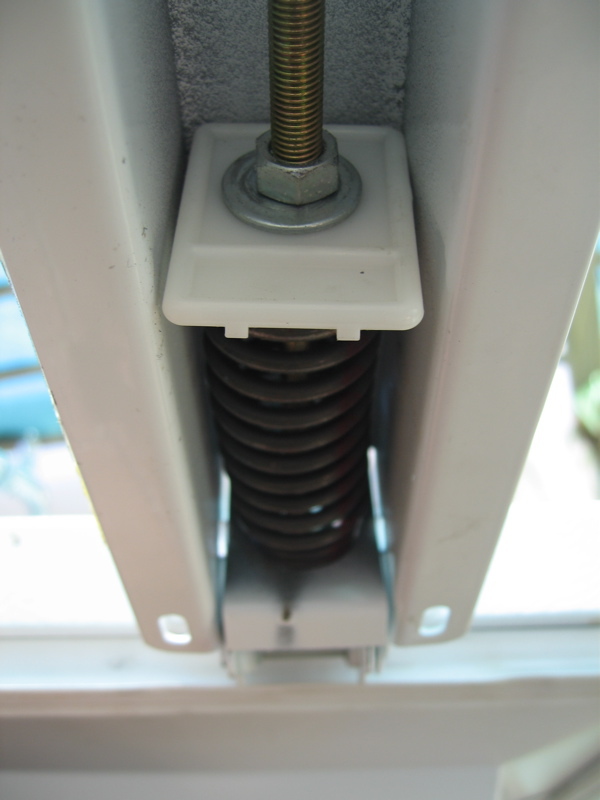 This applies more tension or preload on the spring allowing the hinges to have more support. The lid to my chest freezer is reinforced with a composite board (resists moisture and mold) and with the two tap towers, it add significant weight. While I do not believe extra preload on these springs will allow my lid to easily open and close, it certainly will help. To keep the lid open, I generally need a bungee cord. I'll be stoked if that's no longer needed! 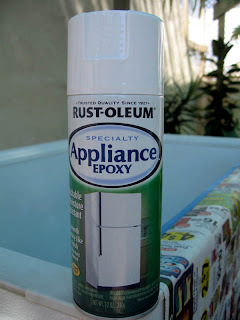 How do I prevent rust from building up inside my chest freezer? Moisture in the liquid form is mainly why this happens. Keeping your kegerator dry inside is challenging but using a dessicator in the form of silica gel seems to work well. 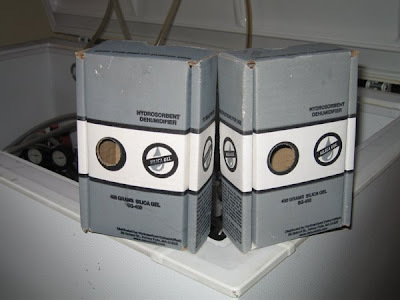 I use Hydrosorbent Dehumidifiers and I'm considering upgrading to one with a larger capacity. Using a dehumidifier along with making sure your chest freezers stays closed and sealed seems to be the only preventative measures from pitting and rusting. A while ago, I started using desiccators to reduce the moisture in the kegerator. This has really helped slow the process and keeps the kegerator relatively dry. The greatest collection of moisture happens when I warm the kegerator up to lager fermentation temperature (50-56 degrees F). When I first started lagering, this is when I noticed a huge increase in oxidation. Last year, I sealed the drain hole for the drip tray to reduce incoming moisture and added a second desiccator. Though the desiccators are really effective, I need to remember to recharge them frequently. This is easily done by removing the bag of silica gel and placing it in the oven at 240'F for 3 hours. On the bottom of the box is an indicator that will turn pink when the bag is saturated. After recharging the silica gel bag, the indicator gradually turns back to blue. 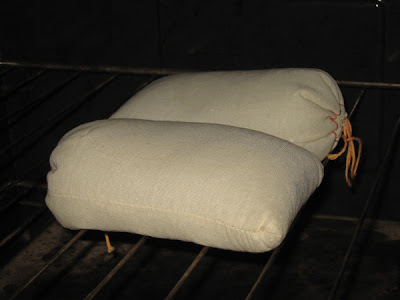 Below is the two silica gel bags in the oven. 24 hours after placing the recharged desiccators back in the kegerator, the interior is bone dry. GREAT article - thanks very much. I have rust starting on the bottom of my chest freezer which I use as a fermentation chamber. Those silica gel bags are just what I need. That epoxy, is it good for food box freezers? Whew! I haven't been on here in a while. Too long. Thanks Dennis. Also check out Eva-dry E-500 High Capacity Renewable Dehumidifier. I use these as well now. While they both seem to have the same absorbing power, the Eva-dry is a plug-in and thus does not tie up your oven for 3+ hours. I plug them in overnight about once a month. Carlos, the paint works on lots of surfaces. Thank you for this excellent write-up and the great pics. My 7.1 cubic ft. kegerator is in desperate need for repair and this has given me the courage to finally get it fixed up (I've had it for over 10 years and have never addressed the rust or moisture issues)! In my deep/chest freezer, it has many small holes on the aluminum interiors. No gas pipe is damaged. It freezes excellent. A few months before, I put some meat in my freezer, there was some blood in the meat, that flowed inside all around the corners of the base and filled in holes. after somedays this blood started producing smell and It was very hard to remove that smell. 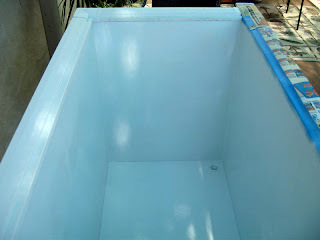 I switched off my freezer and put it in my backyard under sun to get it dry. I left it opened for weeks to remove all the smell and it worked. 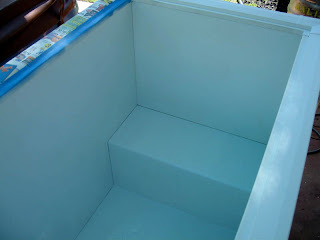 Now my question is... will it be okay to fill all the holes with epoxy and then spray paint inside?... will it effect on the cooling and freezing ?